As a fledgling writer, I have learned that you must be prepared to boil down your story to ever-diminishing lengths. In the case of a screenplay, people will want to see it condensed down to a treatment, to a synopsis, to a paragraph, to a “log line.” Certain individuals will even have the nerve to ask you to sum up your story in a single word. The log line gave me trouble at first, but my answer to the one word description was always simple: Love. 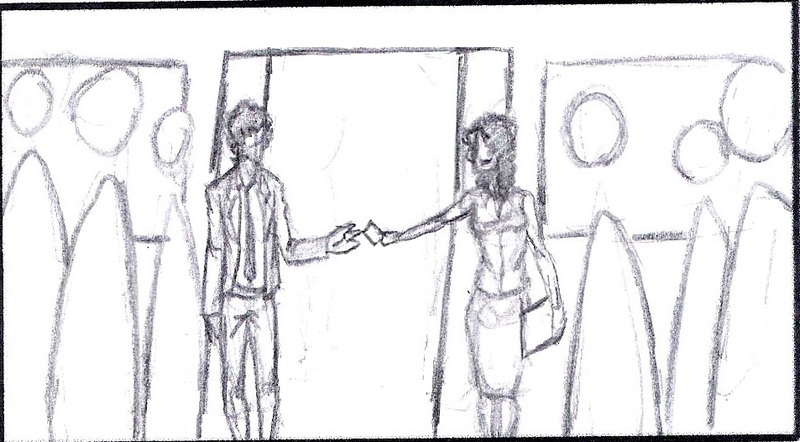 Storyboard: Virgil finally meets April, more of a puppy love bordering on obsession. See the whole scene here. In relationships, First Love takes you by surprise and consumes you like a tidal wave of irrational fervor. The magnitude of the heartbreak that often follows the frequently fickle First Love can make Second Love a bit more wary and defended, something to grow and cultivate over time, but love nonetheless. Then there’s Puppy Love, an idealistic and innocent subcategory of First Love that leaves its victims hopelessly giddy and agitated. It can be an infantile infatuation or a deeper intuition of something greater. Eventually, these early forms of Love evolve into a more comfortable and adult iteration, an open and honest acceptance and appreciation of one another’s flaws and quirks, an ability to simply exist together. Later on, Love often becomes codependent, a frame of reference for life itself whose precedent is difficult to recall and whose absence can’t be imagined, as in the case of many old couples. Love in relationships is sometimes unconditional, sometimes not so much. It can be healthy, it can be obsessive, it can be possessive, and it can be requited, or not. Outside of relationships exists Love of art and music, Love of learning, Love of food, Love of leisure, and many other experience-based forms of Love. Included in this are the varying levels of passion for one's job, for one's career, for one's hobbies, and for cookies and cream ice cream. Then we can't forget Love of Oneself, which in turn projects and extrapolates itself into Familial Love, both for our blood and for our adopted family, from our ancestors to our hopeful babies. Love for one's family, in turn, is really just a microcosm of Love for Mankind, which is itself a small-scale version of Universal Love. Love is the whole story behind the plot in Rolling with Virgil, and I don’t see how it could be otherwise. It’s that emotion that can inspire people to acts of great nobility, desperation, or depravity; that instinct that impels and compels Virgil and every other character in the film; that force that drives me as a writer, an artist, and a human being. I would argue it’s the only thing really worth being driven by. Love, if you ask me, is purpose.